…I unearthed yet more stuff. Two frozen pie shells (which means I still have one left) and some fresh (frozen) cranberries from last Thanksgiving. I am always amazed how well fresh cranberries do in the freezer. Pie seemed like an appropriate endeavor, so I searched around my recipe files and found this Pear-Cranberry Pie with Oatmeal Streusel. It’s super easy to make. This pie is on the tart side, so make sure you serve it with a scoop of vanilla ice cream or sweetened whipped cream. If you don’t have fresh cranberries, frozen (but thawed) from the market will be fine. I loved the oatmeal-streusel topping, it was very…ummm…rustic. Prepare streusel by combining first five ingredients in a medium bowl; cut in butter with a pastry blender or 2 knives until mixture resembles a coarse meal. Combine pear, cranberries, 2/3 cup brown sugar and cornstarch in a large bowl; toss well to combine. Spoon pear mixture into pastry shell; sprinkle streusel over pear mixture. Bake at 350 degrees for 1 hour or until bubbly and streusel is browned. Cool at least 1 hour on a wire rack. Serve with vanilla ice-cream or a sweetened whipped cream. This pie was simply effortless to put together. This looks like a great 4th of July pie. Sprinkle a few blueberries around it and voila! a red , white ( ice cream ) and blue dessert. Looks delicious, and the oats make it more appealing to me. Boy, you come up with some dandies from the depths of your freezer! I have a bag of lamb milk replacer in the depths of mine, what can I do with that? Of course….I love it! There is nothing better than some yummy dessert gracing my plate and knowing it is Cooking Light! Cooking Light desserts that are delicious are just.. meant to be. Looks fabuloous. I should’ve frozen cranberries during the holidays, I remember to do it this year for sure. Your pie looks great! I love cranberries. This looks wonderful. I love the idea of using oatmeal. I keep forgetting it’s so versatile. I use it in meatloaf instead of bread. It was very…rustic. Greatest line ever! This would make a great fallish kind of pie. I might put this away and make it at Thanksgiving. Cathy, you are amazing. How are you finding time to pack pods, bake and post to a blog. The pie is beautiful. Ice cream with it sounds good to me. Ohh I want to spend a day in your freezer! 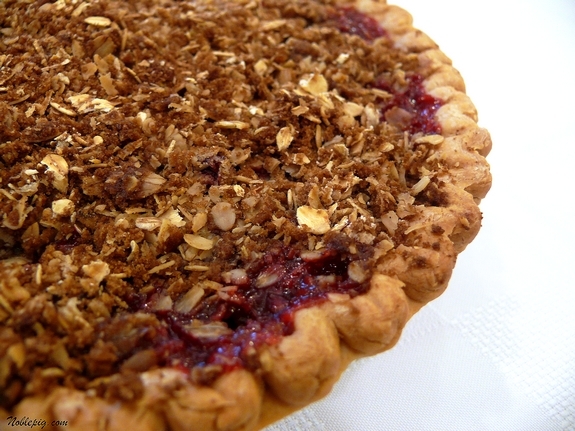 M. m. m. m. m. I love rustic and I love pie and I love cranberries. Looks great to me! I’m impressed w/ your ability to find random foods around and make something great with them! Your recipes are always so scrumptious looking! This one even made me forget (for a minute) that I don’t like fresh cranberries! OMG this looks delicious. What a treat amongst the madness. Oh wow, your pie look so delicious. Pear and cranberry filling certainly good together. So you must be packing up your kitchen last! This looks amazing! I love cranberries! You are doing a great job at using up refound freezer treasures! Great recipes. That sounds delicious! I am really into tart flavors this week. And the pear sounds like a fantastic blend with the cranberries. This will go perfectly with my custard ice cream recipe today. Yum. Me too & in stuffed peppers, recipe courtesy of my Mother-in-law. Scrummy! I think i just drooled a little bit on my keyboard. I swear, I think we could live for a good six months on what we have in our freezer. And actually, Mr. Snoots would love this recipe because he’s a major cranberry fiend. Thanks for the recipe! 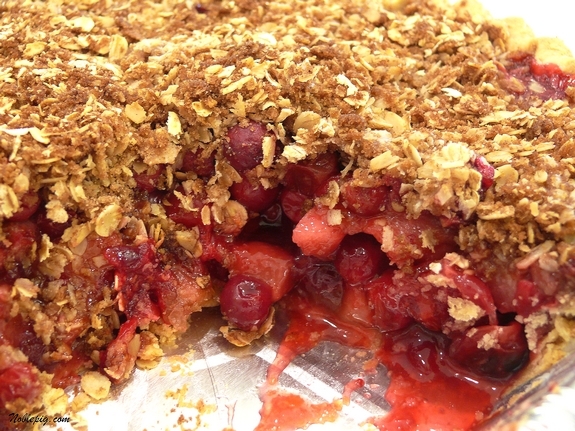 This pie looks so delicious- it’s a great reward for cleaning out the freezer! Love that topping! This looks incredibly delicious. I freeze cranberries, too: they usually end up in muffins or quickbread. Now I have another option! Mmmm…rustic good! That topping looks so great against the ice cream. Beautiful photo. Creative fruit combo too. It looks like you had a lot of fun with this one. I’m making turkey cutlets with a cranberry-pear chutney, tonight for dinner and this would make a really fabulous dessert! Oh wow, that looks awesome! I love pie. I love all things cranberry! Hubby has a new favorite snack: craisins! Wouldn’t he love this pie. 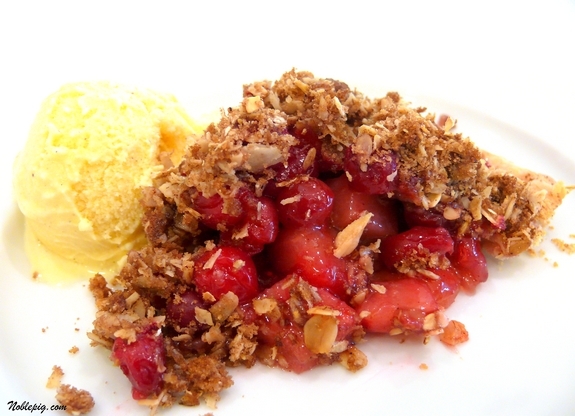 this one is right up my alley… not to sweet with oatmeal-streusel topping. This sounds like a great warming treat on these dreary JUNE, yes still dreary, in June days in Chicago! By now I would weigh 10,000 lbs! And does that ever look delicious! Also love the topping the best. Sounds great and crunchy. I love cranberries and always freeze some for later in the year. This is a great use. This pie will become a staple in the Pond. Oh my, that looks delectable. I’m going to have to put this together for the cookout this weekend! What else is in your freezer? That does look good! I always have frozen cranberries in my freezer. I love streusel. I’d like to make it with just the goup from pie filling (sans fruit) and eat it that way…like scraping it off the top of the apple crisp. That’s always been a temptation of mine. Your pie look gorgeous! Cathy, That looks delicious…..I can only imagine what I would unearth if I were to clean out the freezer…one of these days!!!! I luuuuuuuv crisps, this looks fantastic. I wish berry season would hurry up and get here so I could make one! With rhubarb season over and strawberries on their own not cutting it, I am just twitchy to be able to make something like this. Guess I need to put cranberries in my freezer! Yummy! I love the oatmeal streusel on top! Wish I had a pie crust in my freezer! You are amazing…and very creative. I shudder to think what might be at the bottom of my freezer. I probably won’t find out until I move. Holy cow you can pull things from the depth that look better than my things on the surface….that looks de-lish! Did you see my post about when I was in Cali last week…it was so beautiful…wish I could have stayed longer!!! oooooh, cathy, what a GORGEOUS pie. i would LIVE in your freezer if it meant a slice of this would enter my mouth. 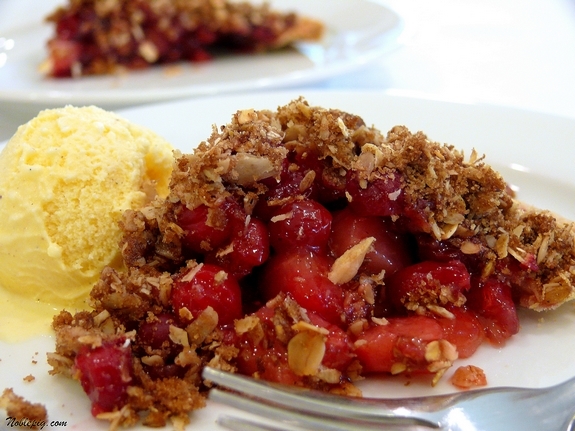 the filling is stunning, and that streusel is an incredible touch. love. I could very easily adapt this recipe to be made without the traditional crust! Yay! Pear and cranberries together sound heavenly! The tart looks really good! I love the topping! Oh…that looks heavenly. But I have a freezer full of tart cherries…wonder how that would work? Oatmeal with cranberries sounds great! And, that scoop of ice cream puts it nicely over the top (in delciciousness). This looks gorgeous! I’ve yet to bake something with berries! Wow does that look amaaaazing! The ingredients look so simple too! I don’t care for pears but that look amazing!!! My only issue is the frozen cranberries… mine never taste right when I freeze them… any idea why? What a creative execution and recipe! While not much of a dessert fan, I adore pears and cranberries, and this one looks absolutely worth a try, thank you! Following my monitoring, thousands of people in the world get the loan from different creditors. Hence, there is good possibilities to get a bank loan in any country.